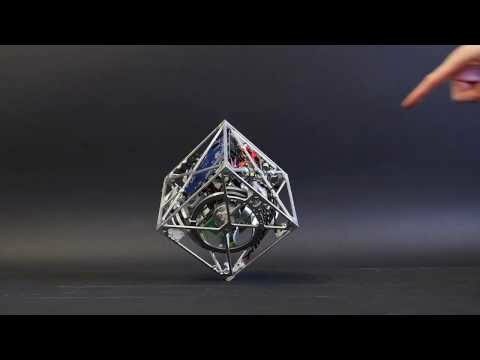 The Cubli is a 15 × 15 × 15 centimeter cube that can jump up and balance on its corner. Reaction wheels mounted on three faces of the cube rotate at high angular velocities and then brake suddenly, causing the Cubli to jump up. Once the Cubli has almost reached the corner stand up position, controlled motor torques are applied to make it balance on its corner. In addition to balancing, the motor torques can also be used to achieve a controlled fall such that the Cubli can be commanded to fall in any arbitrary direction. Combining these three abilities — jumping up, balancing, and controlled falling — the Cubli is able to ‘walk’.